I am always amazed when I hear about comics that were pitched and for some reason weren't made. So many sound like good reasons for companies to take my money. That image above is just incredible. Batgirl as Batwoman. Donna Troy as a Wonder Woman sporting her unitard look. An older Robin. And in the background, Supergirl! Who wouldn't buy this book?? Of course, Batman's son was part of zany Bob Haney's insanity so maybe DC didn't want something like that out there in any form. But here’s the craziest twist…the whole series would be revealed to be a tie-in with none other than ZERO HOUR! Remember how Hal Jordan wanted to create a new, nicer world in Zero Hour? Oh my god! A 'nicer' universe? With an adult Titans/League?? For this Donna Troy alone I would buy the book. But I gotta give some love to this Supergirl with her faux-hawk, point sleeves, and bathing suit look. Just beautiful! We seen precious little of Alex Ross' Supergirl - a panel in Kingdom Come and the Silver Age Kara in Justice. This world should have been part of Multiversity!! 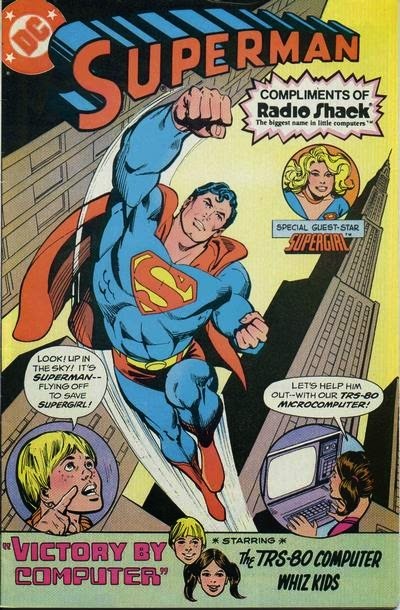 Welcome to a special back issue box review of 'Victory by Computer', a giveaway comic by DC Comics and Radio Shack from way back in 1981. 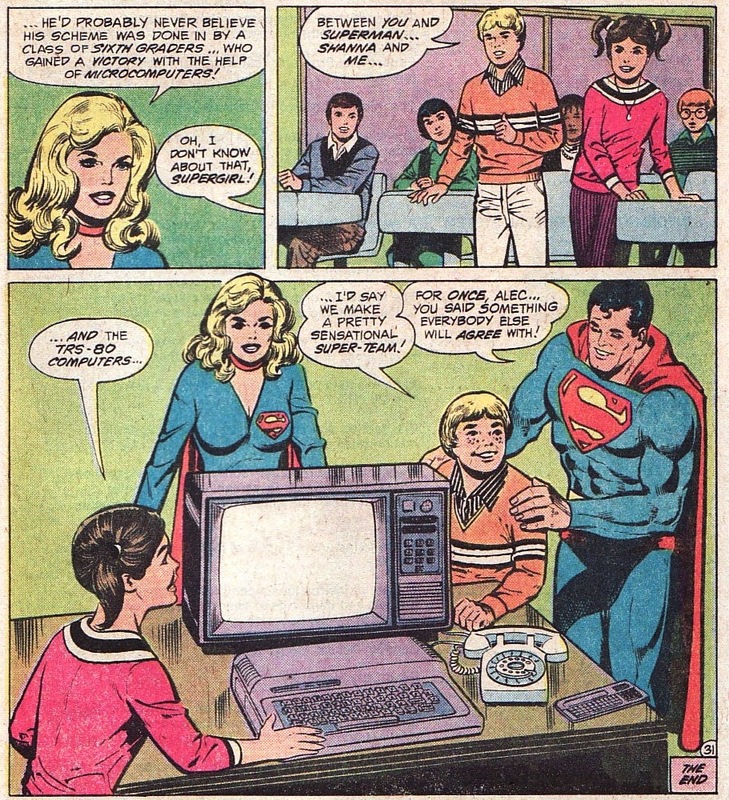 This story included the guest stars of Supergirl as well as the TRS-80 Computer Whiz Kids, Alec and Shanna. 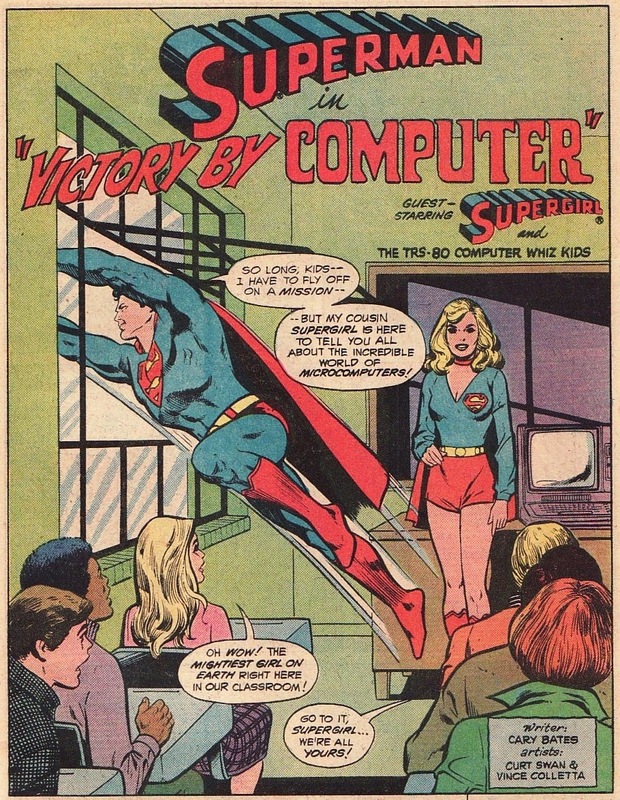 Alec and Shanna had already befriended Superman in 1980's 'The Computers That Saved Metropolis'. The truth is, Supergirl, Shanna, and Alec are the stars of the book. Superman is pretty ancillary to the story. This was a time when computers were typically big and bulky. Home computers were just starting to appear and their utility was limited. Radio Shack, then a pioneer in computing, put out several comics discussing how much computers could help people in their everyday lives. Of course, the books also trumpeted Radio Shack's products as well. It is remarkable to see how prescient this 33 year old book was at predicting the future. We were dealing with a little IT kerfuffle at work this week and that made me remember this book. So I thought I would share. "Victory by Computer" has a pretty famous creative team for a Radio Shack promo book. Cary Bates, Curt Swan, and Vince Colletta are pretty legendary names in DC lore. So I am pretty impressed with creator box on this issue. And I have to say that Supergirl looks positively smashing in this book. 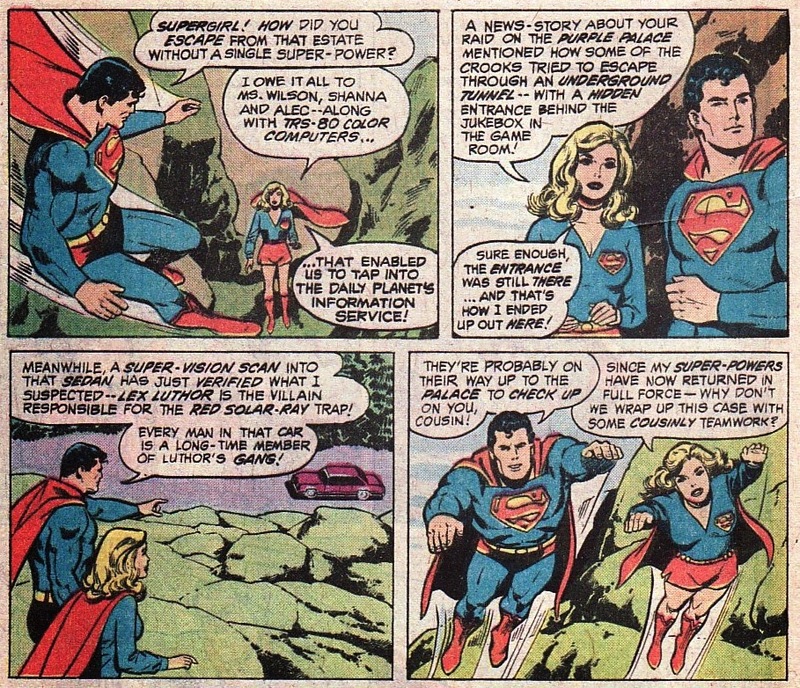 I'm not a huge fan of Curt Swan's take on Kara. But she looks great in this issue, starting out with this opening splash. I think Colletta's inks here bring a sort of Oksner-esque softness to her. 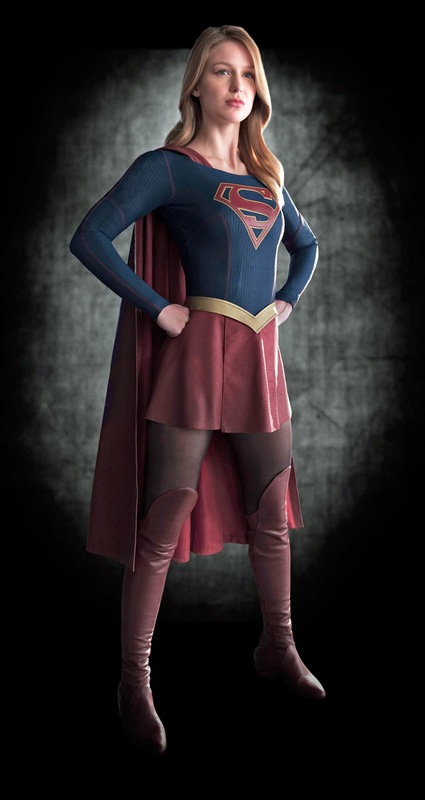 More importantly, my opinion of the hot pants Supergirl costume has really improved over the course of the last few years. Who would think that an old Supergirl fan like me could have some sort of renaissance of thought about older versions. My guess is when I started this blog that I would have listed the hot pants costume near the bottom of my rankings of Supergirl's looks. (The red skirt look is my absolute favorite.) It may be a need for nostalgia or just a change in my taste but I would now rank the hot pants look as my second favorite look. 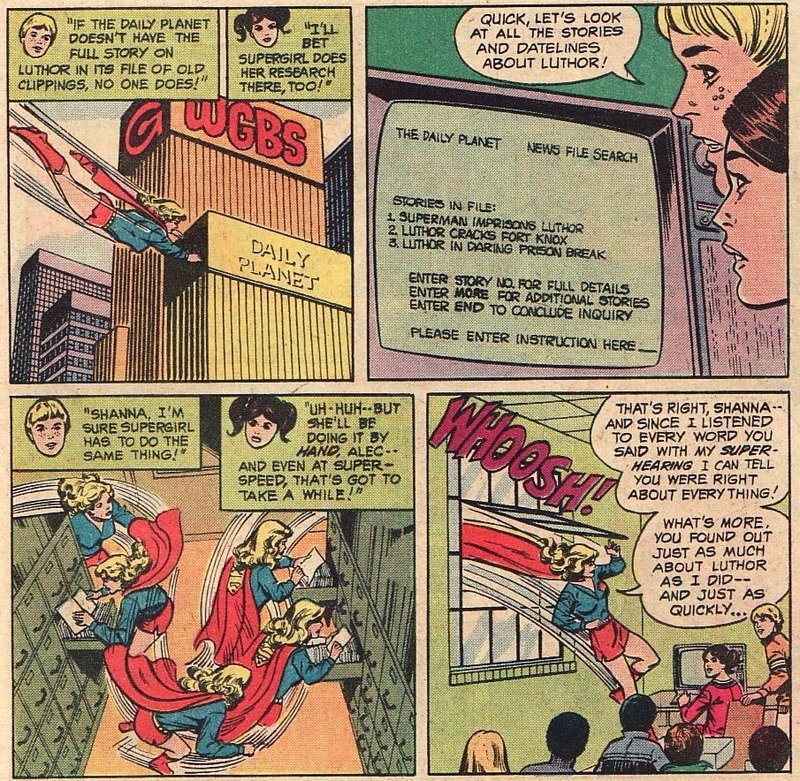 The issue opens with the super-cousins flying into a classroom in an unnamed Metropolis elementary school. In a little exposition, we hear that Superman had visited this same classroom in the past. That time he had 'large boxes' with 'big equipment' ... the actual TRS-80 home computers with the bulky tube monitor, etc. That happened in the prior giveaway issue. Instead, this time, there isn't the need for the big computers ... at least not yet. 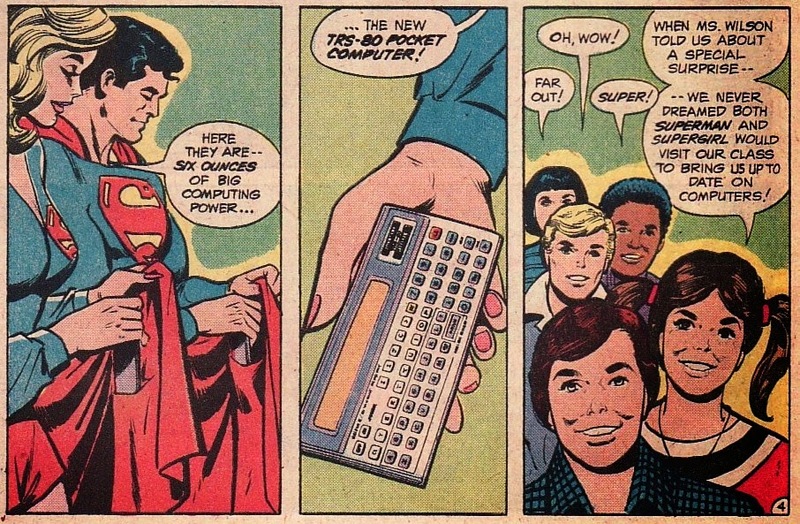 This time the super-cousins have the TRS-80 pocket computer!! Slim, trim, and able to be easily slipped into hidden cape pockets, this computer has all the power of "the old room-sized computers of the late 1940's!" And look at what it can do! Remember words, analyze information, make comparisons. And you can write your own programs in Basic! It's the easiest language to learn! 10 print "Anj is awesome!" Superman is called away to an emergency. An imprisoned Luthor is making boasts in his cell saying today, Superman will free Luthor from prison. Cue wicked laugh! Now it is fascinating to read this comic in today's world of smartphones, the internet, and the power of computing. The technology here is clunky. But I have to say it predicts the future pretty well. My guess is in 1981 all this sounded like Oz. 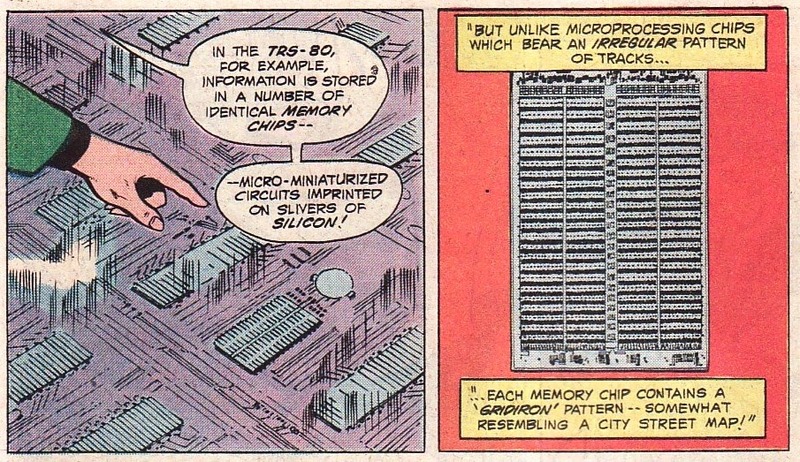 But here Supergirl talks how 'soon' computers will have an informational retrieval system where people will be able to do banking, go shopping, make appointments, etc. That is all right on. The kids use what seems to be a fetal version of the internet called 'Videotex' to do a sort of trial run of some of the things that are possible. The kids just need a land line phone, a modem interface, and TSR-80 'Videotex' terminal, and a monitor. But this old school internet works. Having heard that Superman is going to confront Luthor, Supergirl challenges Alec and Shanna to a race. 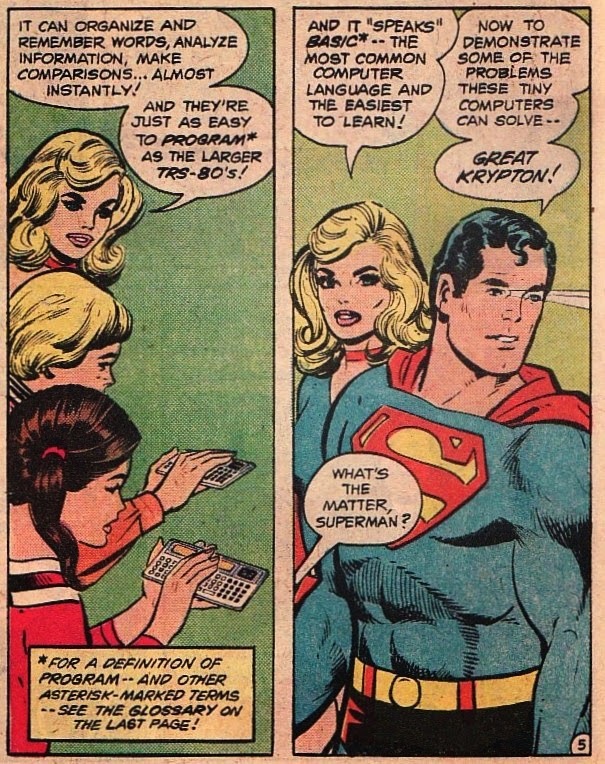 She will use her superpowers, they will use the TRS-80, and they will see who can gather information about Superman's battles with Luthor faster. In the meantime Alec and Shanna type in a password to enter Videotex, type in a few key search words, and get a nice list of electronic documents that are pertinent. I also love ... LOVE ... that Bates has Supergirl tell the teacher that she is comfortable in front of kids because her day job is in a classroom, a reference to Linda's time as a counselor at the New Athens Experimental School. While the kids head off to the Metropolis Museum of Science and Industry, Supergirl decides to patrol Metropolis. She promised Superman she would watch the place while he was dealing with Luthor. She notices in the mountains off the outskirts of Metropolis a secluded building which is emitting a microwave beam which could interfere with planes nearby. As Supergirl flies to investigate, the 'solar panels' on the roof flip to become red sun radiation emitters. Suddenly powerless, Supergirl falls into the open roof area of the building. It is all a trap. Of course this isn't just a Superman and Supergirl adventure. This is a promotional book about computers. So we get a couple of pages dedicated to the history of computers, from the vacuum tube to microprocessors to silicon chips. Supergirl wakes up imprisoned in what looks to be a hotel room in a club/casino. The doors are adorned with pictures of dice and the double letters PP. 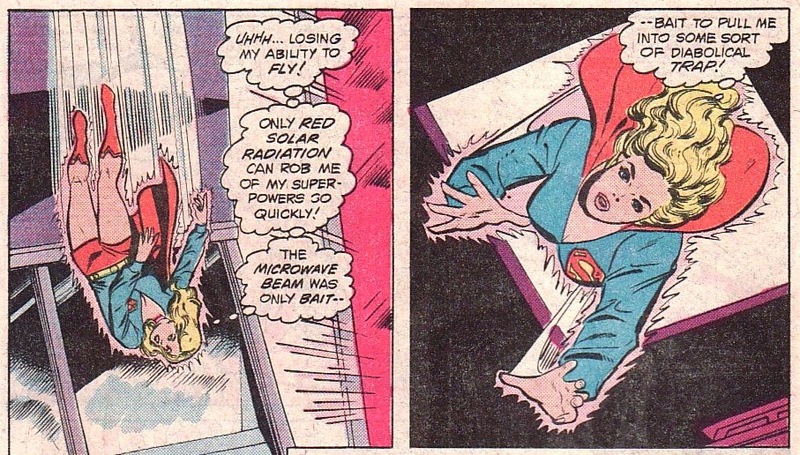 Without her powers (she assumes the red sun radiation permeates the building), Kara is left to her own devices. Using a paper clip, she picks the lock of the room she is trapped in. Who knew she had such mad skills! And, luckily, the room next door is equipped with a TRS-80, land line phone and modem! What luck!! The highest of technology! 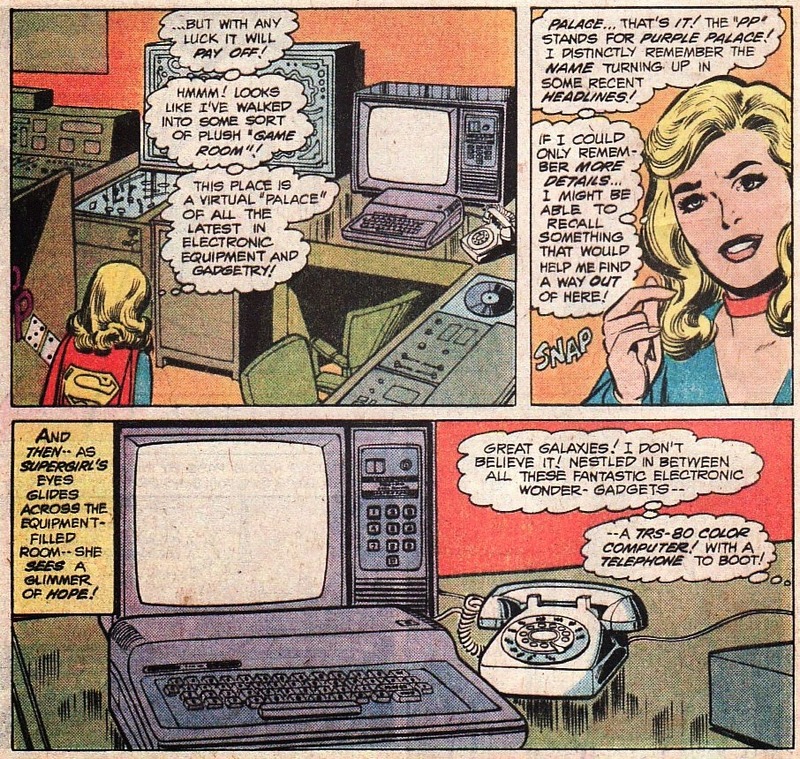 Realizing she must be in the 'Purple Palace' (the PP on the doors), Supergirl decides to use the computer to get some help. 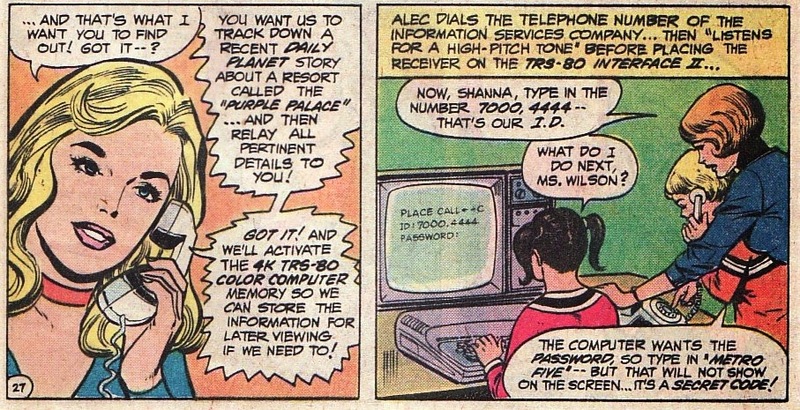 Calling Alec and Shanna (they are back at school), Supergirl works with them to scan Videotex to find out the address and send Supergirl a bunch of important information. And don't worry, passwords are needed and not visible on the TRS-80. Superman finally returns to the classroom to hear what has happened. Alec and Shanna are able to give him the address of the Palace and so he flies off to rescue Supergirl. Hold on! Won't he also be effected by the red sun emitter?? Well, he would have been if he had to get really close to the Palace. But Supergirl used her computer search to read about a recent police sting on the Palace. And in that article, she read about a secret passage away from the Palace. She has escaped and is now far enough away that the Red Sun radiation isn't effecting either cousin. 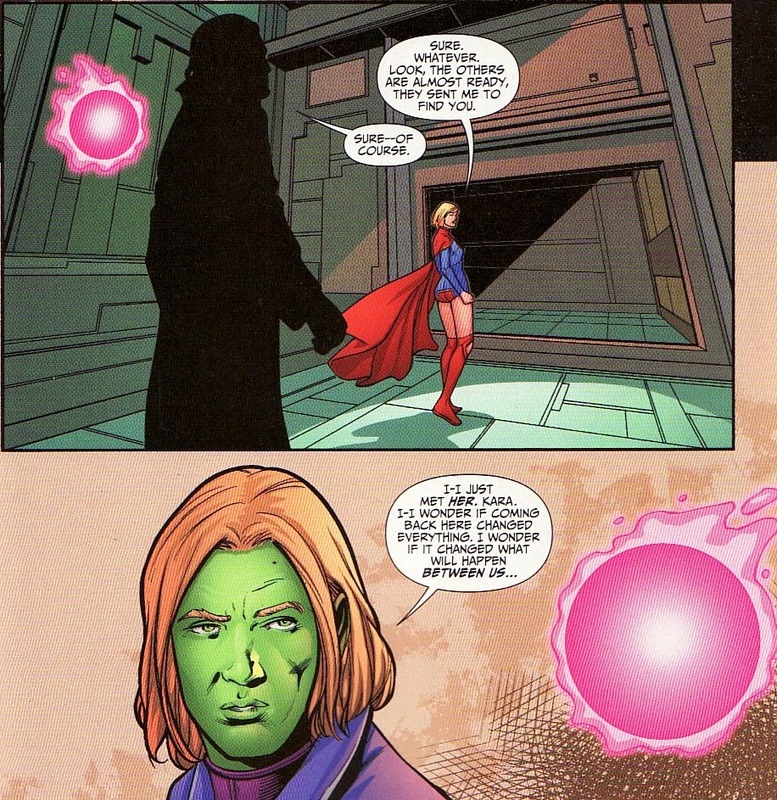 Luthor had convinced the mobsters running the Palace to capture Supergirl to use as ransom, forcing Superman to free Lex. 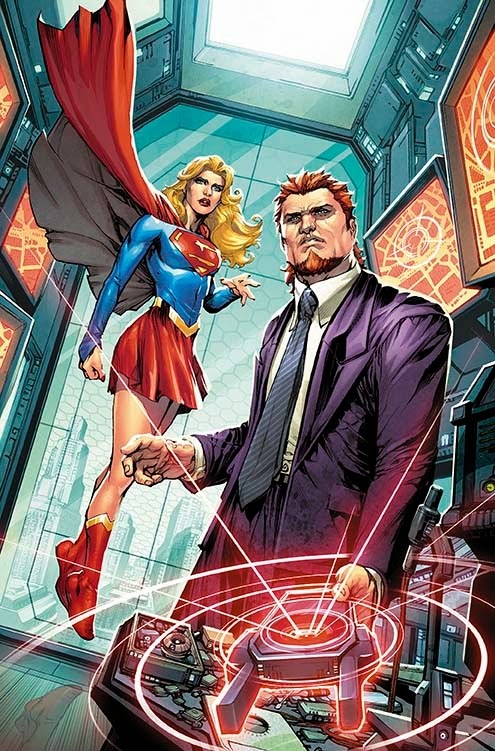 With Supergirl now free, the super-cousins capture the mobsters and leave Lex tucked in his cell. But seriously, if you have a huge casino complex, why would you lock Supergirl in the room that has a hidden escape tunnel? Why not put her in ... I don't know ... any other room?? Of course none of this would have been possible without the slick computer work by Alec and Shanna and their savvy use of all the technological might of the TRS-80! What a team!!! 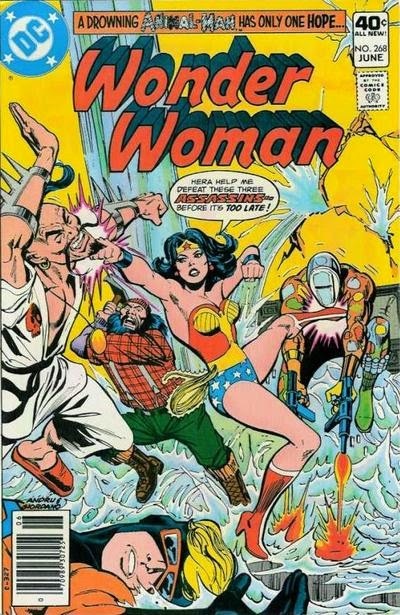 This is far more interesting to me as a look into the past than as a Supergirl or Superman story. It is fascinating to see just what computing was like back then. And I was astounded to see just how forward thinking Radio Shack was about the power of personal computing. Still, it is also a fun little Supergirl story. Seeing her pick a lock, talk about her career as a teacher, and using her brains to get out of a jam makes me happy. Superman has little to do with this story. And he doesn't rescue Kara. She rescues herself. I find oddities like this round out collections. I am happy to have it in my Supergirl stuff. Overall, it is of low historical importance to the character. Hope you liked this look back. Despite losing the solo comic to the post-Convergence DCU, Supergirl fans have a lot to look forward to in the Convergence mini-series. 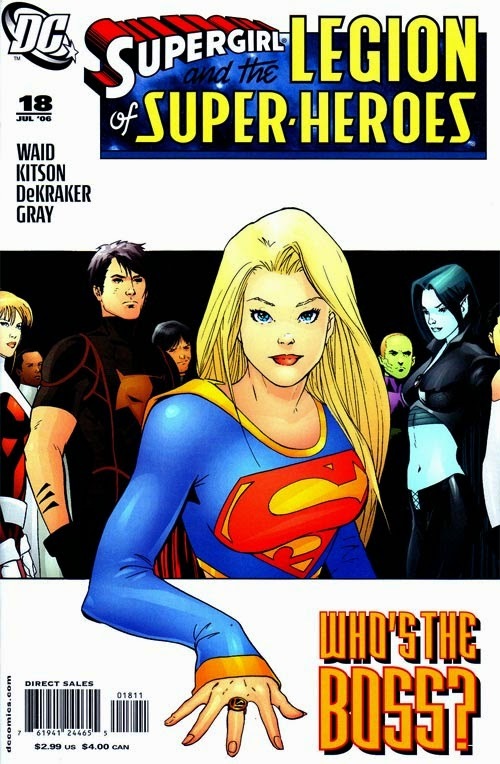 There are three versions of Supergirl in the Convergence mini-series. We have Crisis Kara. We have Kara from the Robinson JLA era. And we have Matrix Supergirl, in her own mini-series, and apparently before the merge with Linda Danvers. Of all the mini-series, this one intrigues me the most. I have come to appreciate the Matrix Supergirl, especially her character post-'Death of Superman'. I also worry this mini-series by Keith Giffen might be awful. And judging by the cover, we are probably in a time at or around the death of Superman. She is still with Lex. Intrigued. Congrats to Sue for the scoop! Lets take a look at the intro pages, catching us up p on her history. I'll try to fill in some details. These early stories show a very naive Matrix. Her earliest story have her more like a Silver Age Supergirl, overly sweet and innocent. After the lost battle on the pocket Earth, she lives on the Kent farm, a skittish waif. In a nice plot twist, she takes Superman's place when he exiles himself to space after executing the Phantom Zone villains. It is the first breakdown of her sanity. When Superman returns, it is Matrix who leaves the planet, hoping to find herself. These early years of Matrix were tough for Supergirl fans. She becomes the slave of Brainiac. 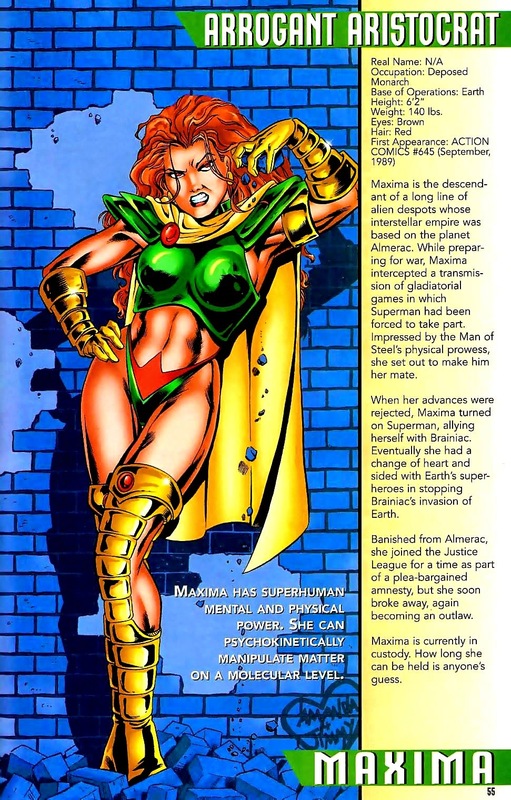 She becomes the lover and dupe of Lex. It is only when she becomes one of the heroes in Metropolis after Superman's 'death' that we see her begin to mature into something special. So let's hear it Matrix fans! What do you do when you are a good person, trying to do good, but grow weary of fighting a battle that is truly never-ending? What do you do when fatigue sets in? When you lose sight of all the good you have done, instead focusing on everything else that still needs to be helped? What do you do? 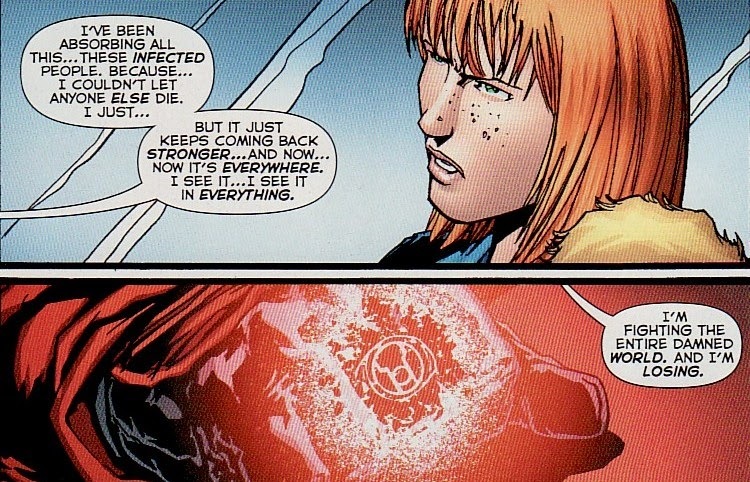 Red Lanterns #40 strives to answer those questions. 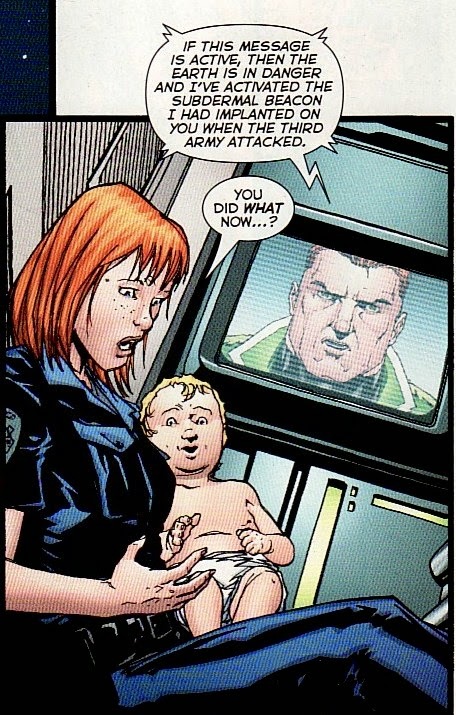 It shows us a Guy Gardner who has just about reached his limit. He is a good man. 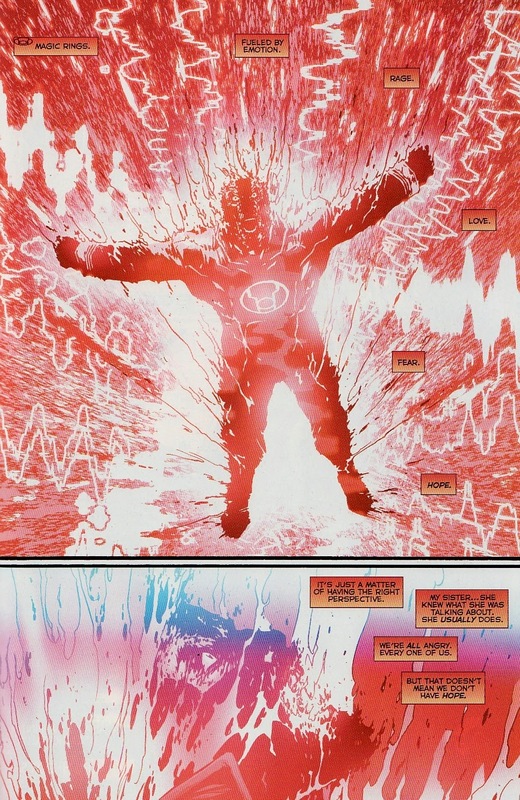 He is trying to purge the world of Atrocitus' plague of rage. But no matter how much he does, there is always more madness, more rage, more death and horror. And despite realizing that he will never be able to win this war, he plods on. He is broken man, despondent, exhausted, trying to do good but about to lose hope. Landry Walker writes this brilliant issue looking at a super-hero burned out from the fight. This is the last issue of Red Lanterns and so why not make it a character driven issue, focusing on Guy, and giving us an open-ended finale. I worry if this gem will somehow be lost on the racks, the forgotten 'last issue' of a corner of the universe about the be rebooted. There were parts of this issue that truly resonated with me. There are times where the grind is about to finally pulverize me and then suddenly I am reminded to keep my eyes on the prize. And as usual, Jim Calafiore's thick lined is perfect for this book. 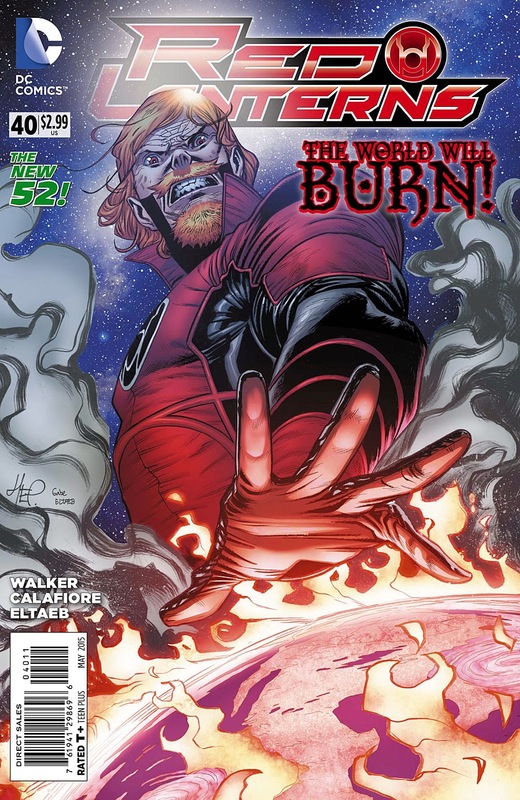 In the last three issues, we have seen Guy trying to root out all the pockets of rage left by Atrocitus. We have seen him wade in the abattoir of a destroyed town. We have seen him battle a rage vampire. Around every corner is some depravity, some reminder of how cruel and terrible humanity can be. Even Guy realizes that wearing a Corps ring changes a person. Makes them someone different. Being a Red, seeing all the things he has seen, exposing himself to this mad rage has changed him. Look at this panel with Guy sporting this mane of hair, those sullen eyes, that crazed grimace. He has seen too much and fought too long. He has been changed. 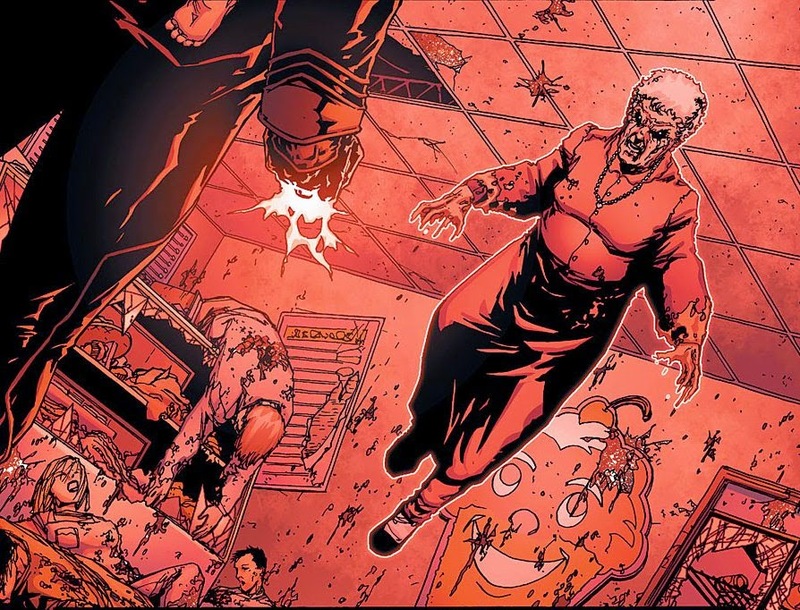 And who wouldn't be when day in day out you are exposed to scenes like this, a blood bath in an ice cream shoppe, a crazed elderly woman floating over carnage. Who wouldn't grow tired of this fight if you knew the next round was going to be just as horrific? He turns to his sister for some solace. He is trying his best to rid the world of anger. He has been absorbing this rage. He is trying to save people. But all he sees is the next fight. His whole body language, his unkempt appearance screams he is losing hope. He knows he has to keep fighting ... but how do you pick yourself up when life is pulling you down? His sister decides that he needs a little tough love. That seems like the Gardner way. But this is a bit of a 'pull yourself together' speech. He can't rid the world of anger because sometimes rage is a healthy response. And calling Guy a pretentious jerk is cutting. When did Guy decide he had the right to speak for the world? Guy might always be a jerk. But pretentious? Never. He's down to Earth. Instead all this rage that Guy has absorbed seems to overwhelm him. He is ready to release it all back to the Earth ... all of it and more. And with the world on the verge of being engulfed in madness, Guy sends his sister and the baby from last issue into a orbiting life pod. The thing that got me here was the image of Guy on the pretaped message. When was the last time we saw a clean shaven, crew-cutted Guy? That is a different Guy, one that hasn't seen what the current Guy has seen, hasn't done what the current Guy has done. From space, Guy's sister still tries to help him. He is attacking this problem wrong. You need to not dwell on the darkness, not be overtaken by it, not give in to it. Instead, help the world and see the bright side. And maybe ... just maybe ... this speech jars something in Guy. There is always hope. Before he lets the rage consume him, he needs to have hope in humanity. Of course he has hope. Otherwise, why would he keep fighting? In a truly cathartic page, Guy vomits all the rage away, ridding himself of all of it. That second panel is just sublime, just enough of a tint of blue in to give us that hint of hope. With the rage gone, we see the Red Ring on the ground. And then we see Guy again. Suddenly he is ... well ... he's Guy again. And then we see the classic Guy smirk with hope to find a ring and use it for good. No more weariness. No more pain. No more rage. No more self-loathing. No more despair. The name of this story is 'Hope'. Classic. 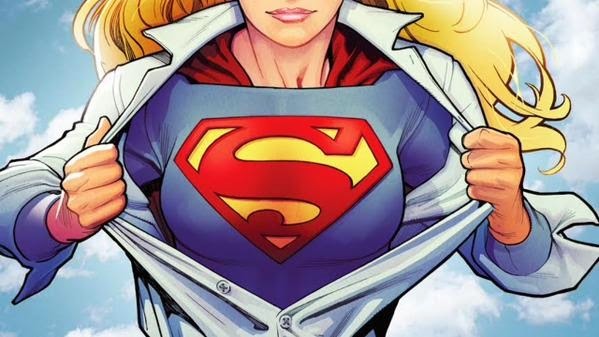 In June, DC Comics won't publish a Supergirl book. In September, CBS will air a Supergirl show. 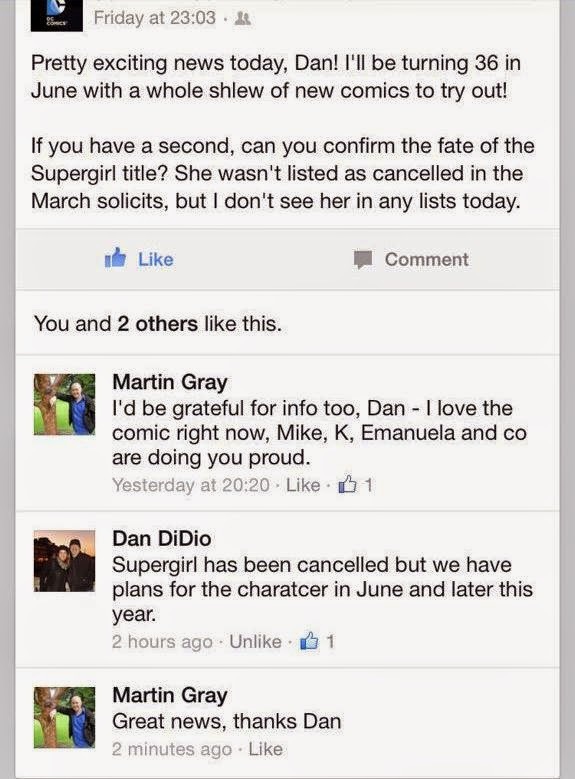 And we know that DC has some plans for Supergirl 'later this year'. Now the sentiment is that DC has paused Supergirl as a book to try to re-align the comic character with the television show character. I have questioned the rationality of that. We didn't need to cancel Green Arrow or The Flash or Constantine or Batman because of the shows Arrow, The Flash, Constantine, and Gotham respectively. But let's just say that the reason why DC is pausing the Supergirl book is to re-align things (which I think is the reason). The 24 year old working woman. 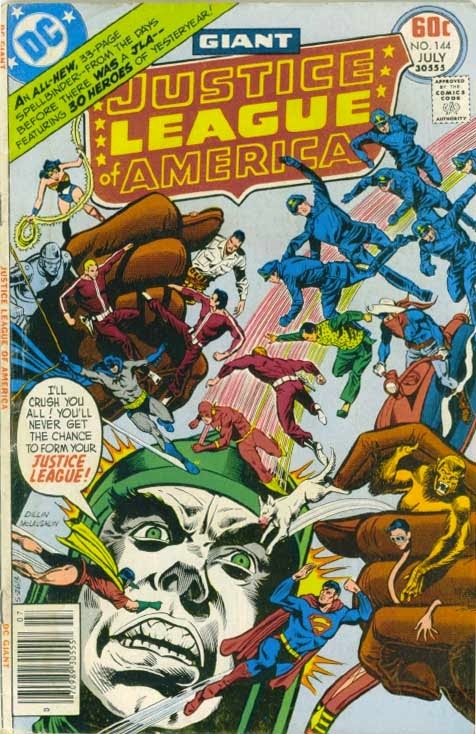 Well in the past, I had a theory that DC could shunt Supergirl into the future with the Legion. Let's say she spends 5 years in the future and then returns as a 22 year old. Suddenly you can align Kara and her TV character a bit more. And you can leave those five years unexplored in continuity. They can be like the five years of the Five Years Later Legion or the One Year Later after 52. It also leverages an existing historical association between Supergirl and the Legion. That might make older fans like more easily tolerate that we are missing out on part of the hero's journey. But even that theory was something of a stretch at first. There was no Legion in the DCU. And there was no reason or rationale behind Supergirl heading into the 31st century. 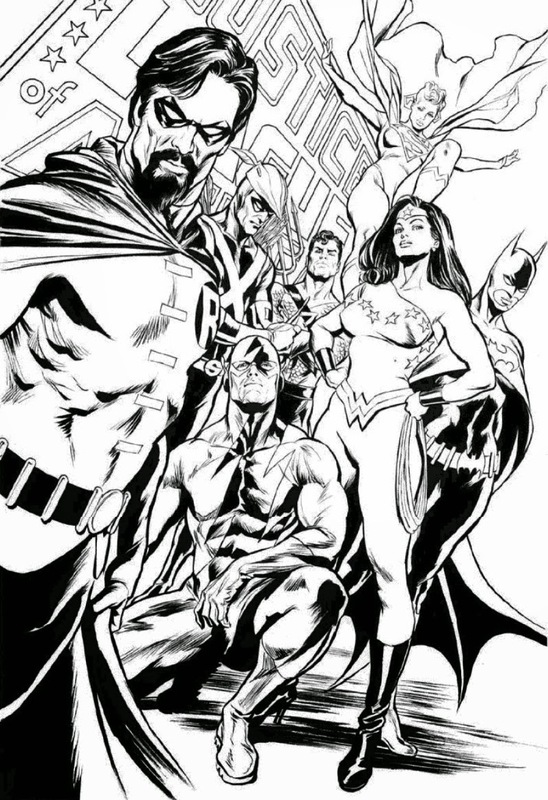 But then we got this moment in Justice League United #10. First off, Infinitus in JLU reestablished a Legion in the current Earth-0 universe. But then we get this scene where we learn that Supergirl and Brainiac 5 have met before when he is younger and she is older. There suddenly is a history ... even if it hasn't happened yet. Could this little side scene be a way that DC can explain or rationalize sending Supergirl into the future? That she heads to the future, joins the Legion. And then she has a falling out (maybe whatever happened with Brainy as hinted here) and that prompts her to return to the present? Could these 2 panels pave the way for my theory to come true?? I'd go 'all in' if this was a comic book high stakes poker game! 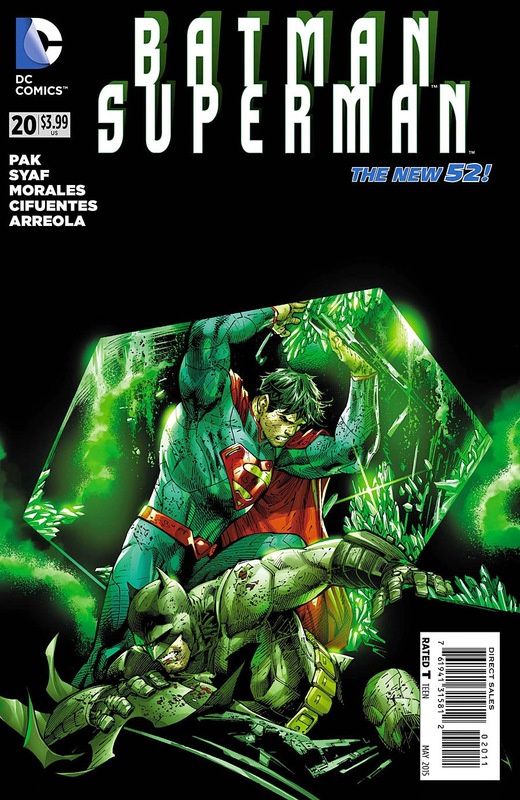 Batman/Superman #20 came out last week, the finale to the Superman's Joker. This has been an interesting story that showcases the differences between our title characters and their villains. After something of a slow buildup, we sprint to the ending. And it is a rough ending, a pyrrhic victory that truly felt more like a Batman story ... heck more like a Daredevil story ... where the margin of victory is slim, hope is an ideal, and losses are great. 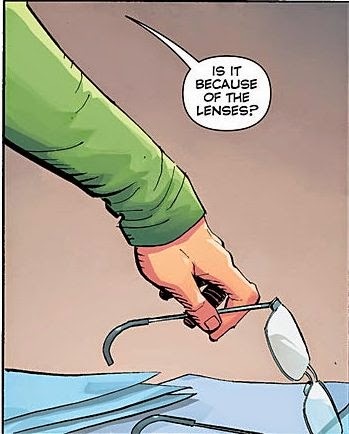 Greg Pak does a good job of showing us how difficult it would be for Superman to engage with someone hellbent on breaking him down both physically and psychologically. Trying to win, trying not to sink down to the level of your enemies, trying to hold on to hope ... it is interesting to see Superman struggle. As I have said about Pak, the strength of his stories has been the ability to place Superman in environments that are pushing Superman into the unknown. This sort of dark revenge tale by Dr. Xa-Du is odd for Superman, and that means it feels novel. Adrian Syaf is on pencils here and does a fine job. Things are rougher and scratchier and more warped in places than I would hope. especially given the futuristic setting of Kandor. To recap, Dr. Xa-Du has awoken the Kandorians from the suspended animation and using 'living death' has taken control of their minds. 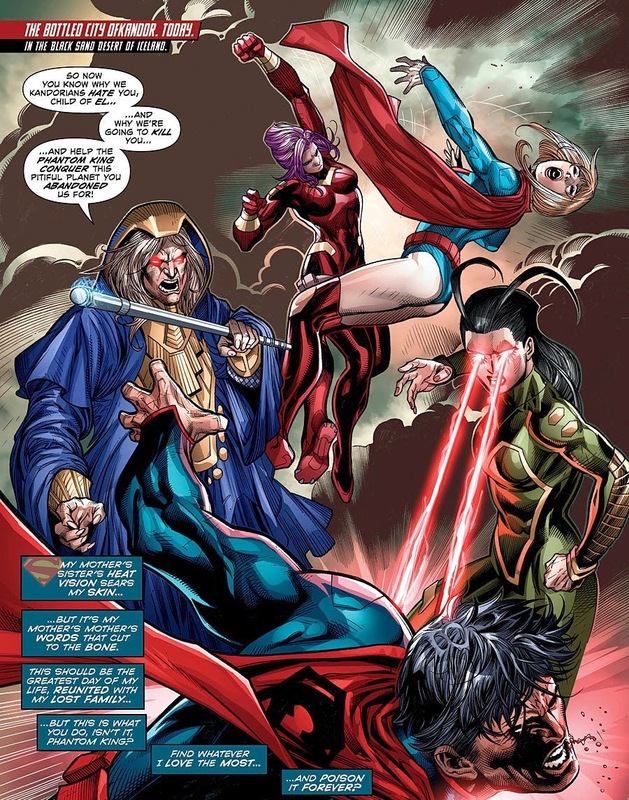 Filled with hate and distrust of the El family, the Kandorians (including Superman's maternal grandmother and maternal aunt) have been attacking both Superman and people he loves. Now being shrunk, trapped in a bottle, and in suspended animation is bad enough. But Pak throws in a new wrinkle that makes things more horrific. The Kandorians were mentally awake while their bodies were dormant! If that is true than the Kandorians have been stuck in their bodies ... locked in with only their thoughts ... for about three decades. They all should be stark raving mad even without Xa-Du. But how devastating it must be for Superman and Supergirl to be fighting their loved ones. We get some exposition Lois and Ray Palmer. Floating in the Ant Farm, they give us some of the back story of Dr. Xa-Du. First Phantom Zone villain. Creator of the Living Death. Hater of the El family. I do love Xa-Du's design. The Negative Man bandages with the glowing head and tattered cape is a great design. It is just the right mix of horror and science fiction. 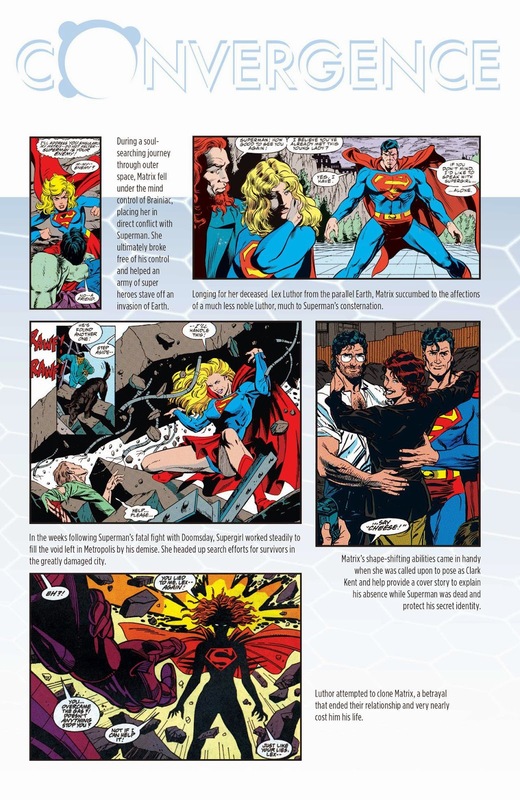 The book, for the most part, is a brawl between Superman and Supergirl versus their family and friends. Of course, this is a Batman book too. So he shows up with a red sun baton which he uses to beat up an old woman. And I am a bit tired of the 'Batman is prepared for everything' idea. If he had this red sun truncheon, why didn't he break it out in the Doomsday arc? 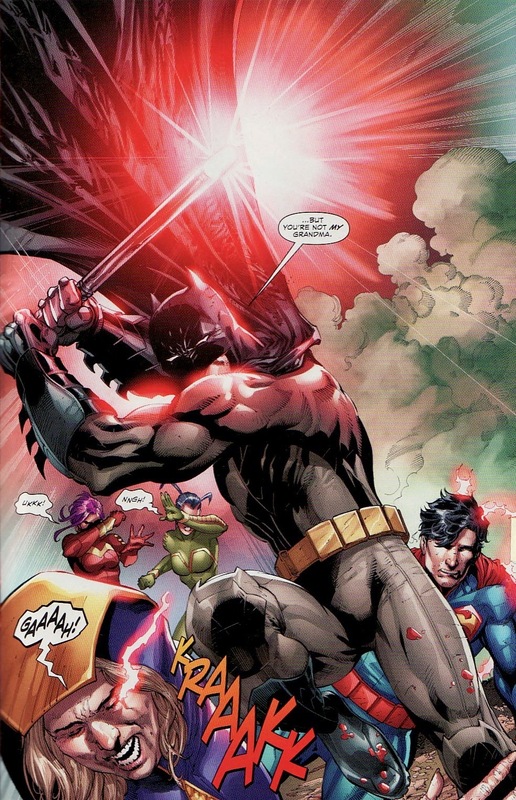 In the battle, it looks like Batman is vaporized by Superman's aunt. One more death at the extended hand of Superman's Joker? It shows just how much under the skin of the super-cousins Xa-Du has dug. The only way to stop them is to beat them down. 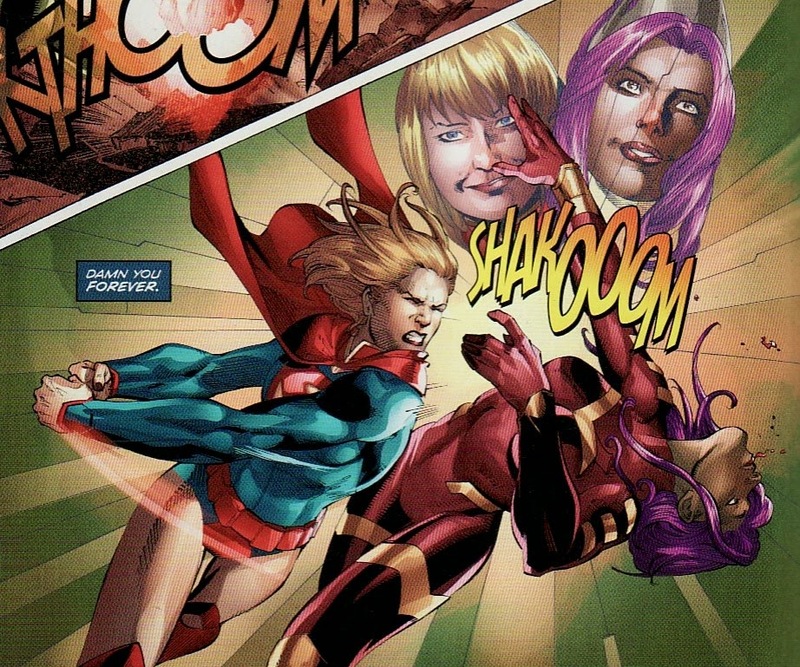 I can only imagine how hard it is for Kara, who has felt so alone during this New 52 universe, to pummel her friend. With the city's bottle broken more and more Kandorians gaining powers under the yellow sun, Superman uses his heat vision to explode the red sun baton making it a red sun grenade. The mind-controlled Kandorians are temporarily incapacitated. Okay ... seems like an answer plucked out of the air, a sort of deus ex machina. Too fast? I think I had no idea that this could happen so it fell a little flat. But that's that. Xa-Du is gone as is his control over the Kandorians. Well ... his control is gone ... mostly. The bottle is rebuilt. The city is safe and it's citizens awake. But 1.3% of the population remains crazed for vengeance against the El family. Superman's relatives and Tali are in that group. 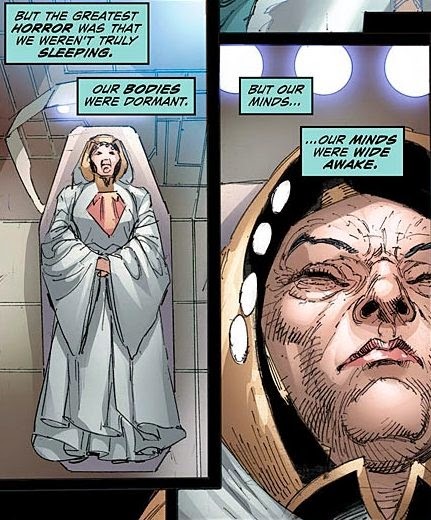 Kryptonian scientists have no recourse but to put those effected into a medical coma. So it is a bittersweet victory for Superman and Supergirl. 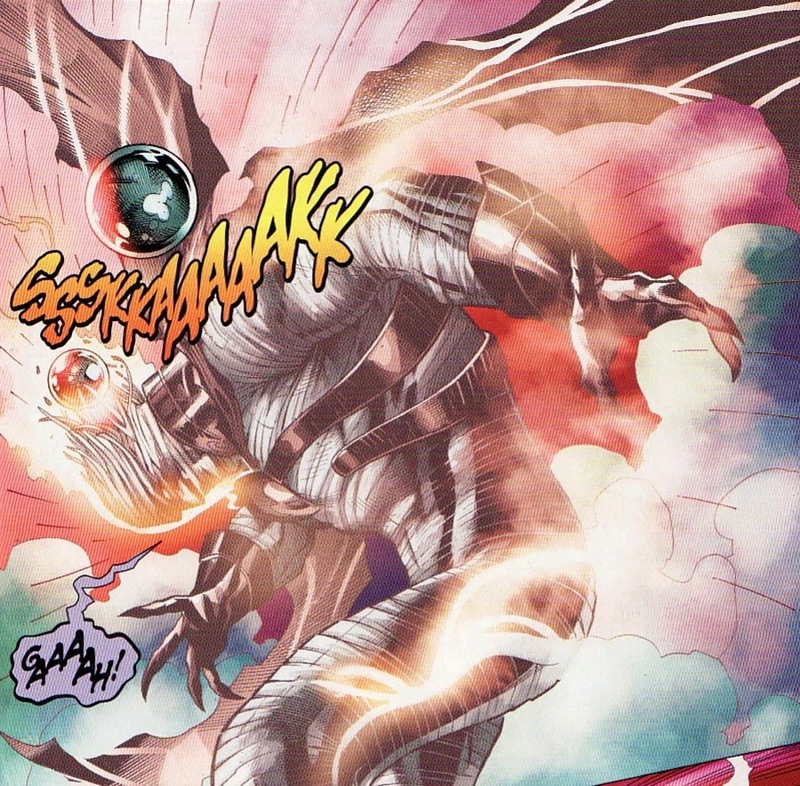 They have defeated Xa-Du but at great cost, as battles with someone like the Joker often do. But we end on a good note. The young girl struck down by the Kandorians, the amalgam of the suicidal teens in All-Star Superman and Grounded has survived. And this time, she gets to say to Superman that he is stronger than he thinks. That he needs to keep on doing what's right. Because he saved her. Okay, way to stick the ending Mr. Pak. It is nice to see the dawn after seeing the darkest times before it. While the battle in this issue and how Xa-Du is defeated were sort of missteps for me, the rest of this arc was pretty meaty. 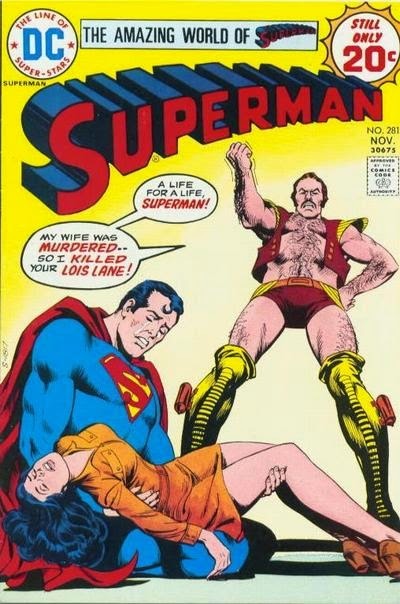 This was a dark trip for Superman. We saw him have to deal with a darker sort of villain. And now we have a real Kandor to become part of the Superman mythos. There has been so much news and leaks from the Supergirl TV show that I am drowning in optimism. From seeing director Glen Winter with Supergirl movie director Jeannot Szwarc, to hearing Winter say he believes a girl can fly, to Geoff Johns talking about an iconic shot he witnessed, everything has been tantalizing! Just what publicity should do. Now the latest casting news has come out. I don't watch the Mentalist so can't comment on him there. 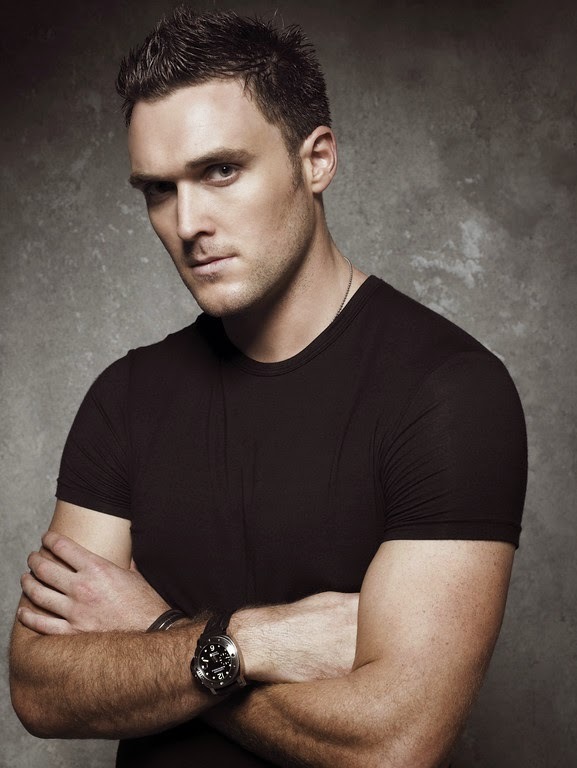 And I did watch Extant but can't place his character there either. He certainly looks rugged enough to be Vartox. But all the links describe Vartox as a villain. I never fully subscribed to Vartox as a bad guy. He was sort of the Superman for his world before all sort of tragedy struck him. I can imagine him being some sort of pheromone powered alien Lothario. This will give the producers an excuse to put him in something akin to his comic book costume. But with him being listed as a villain, I am beginning to see a pattern in these casting and character announcements. All of the villains are aliens! I wonder if the running story for the season is going to be Kara dealing with an undercover alien invasion of Earth. Or an extra-terrestrial cabal trying to control the planet. I have wholeheartedly jumped on Count Drunkula's guess that The Commander is going to be Commander Blanx. He'll be the head of this alien organization. And we already heard in leaked Lumberjack audition tapes that the Lumberjack is an alien as well, someone with three hearts, someone where on 'his planet' women know their place. With this idea of aliens being the set up for bad guys I wondered who else we might see. Or Byth as a shape changer? 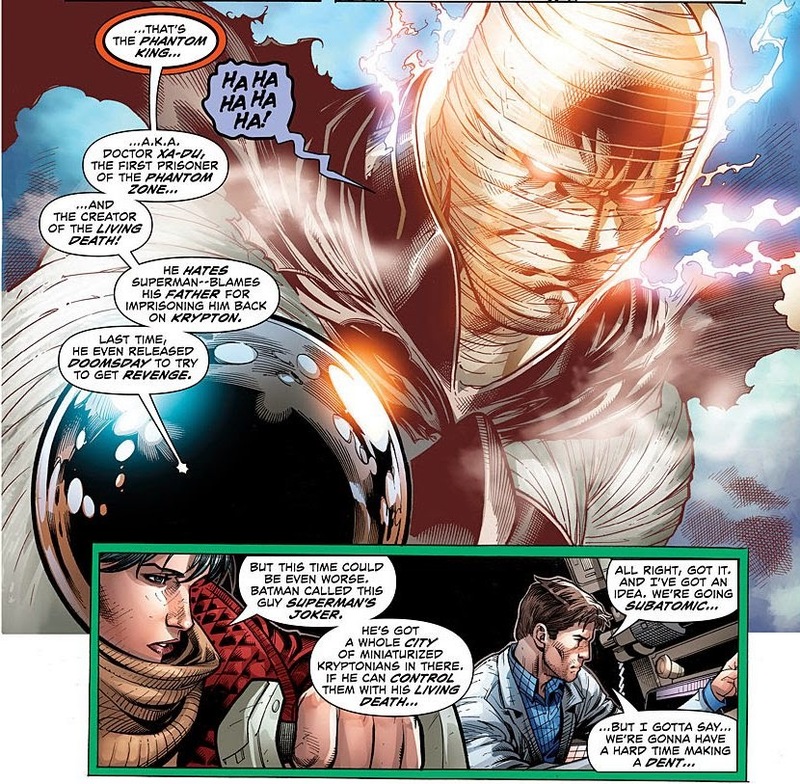 Maybe a Naltorian who can predict Supergirl's actions? And all this will dovetail into Hank Henshaw feeling that humans are outmatched by these visitors from other planets. He'll start to distrust them all. And he'll feel that he needs to improve himself to combat them ... slowly becoming a cyborg super man. 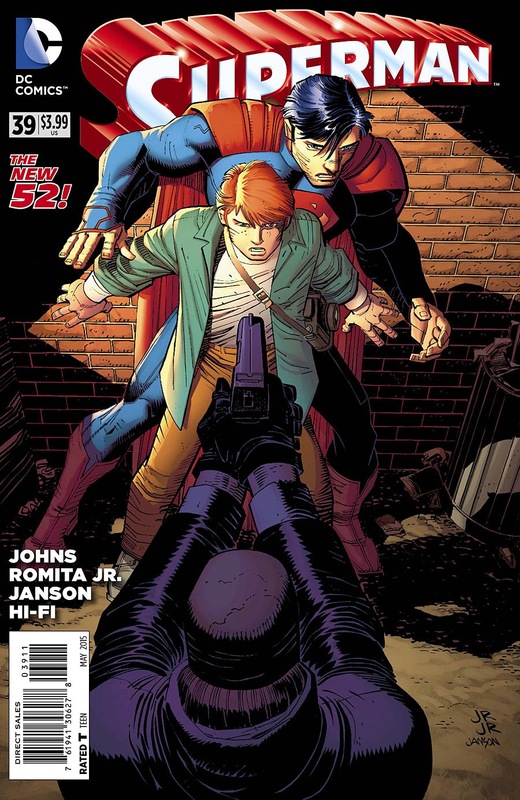 Superman #39 came out this last week, the final issue for the mega-team of writer Geoff Johns and artist John Romita Jr.
With the Ulysses storyline in the rear view mirror, Johns decides to slow things down and give us a character-driven issue. Living without his powers (because of his super-flare energy depletion), we get a day in the life of vulnerable Superman. And with Jimmy in on Clark's secret identity, we get to see how Superman's Pal reacts to not only the secret but also to who Superman is, what he represents. One thing I feel is that Superman has been diminished a little over the last few years. The initial New 52 Superman had feet of clay, wasn't inspirational, and as a result I struggled with caring. In recent times, with Pak on Action and Johns on here, we are reapproaching the sort of Superman I need to read. And this issue brought me back to a simpler time where Superman was bigger than life, the person we should aspire to be like, a hero. 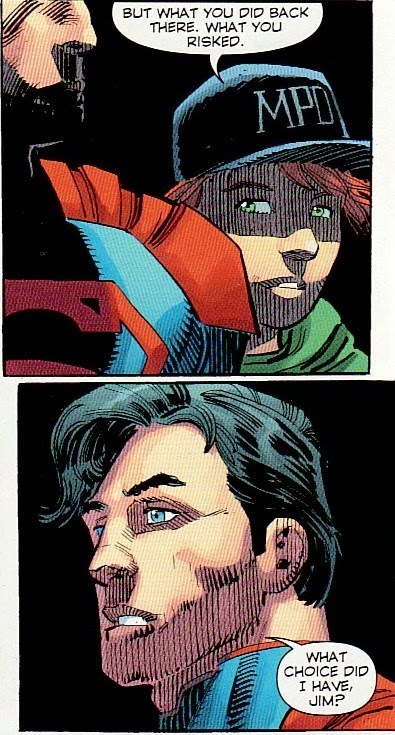 I am also one of those people who feels that Superman is the mask and Clark is the real person. I think that Superman would emphasize the 'man' part of his name. And it is Clark's upbringing, the lessons Ma and Pa gave him, that shaped who he is. We have seen Superman without powers before and we have seen him fight for truth and justice without powers before as well. But this issue, in the context of the New 52, felt fresh. Romita and inker Klaus Janson's art is blocky and relatively ugly. But at least there is some meat on the bones here. There aren't many of those needless splash pages that have eaten up story space in this issue. And the one oversized paneled two page spread has an artistic resonance. I don't know if Johns was planning for his run to be short because he is leaving a pretty big subplot open. 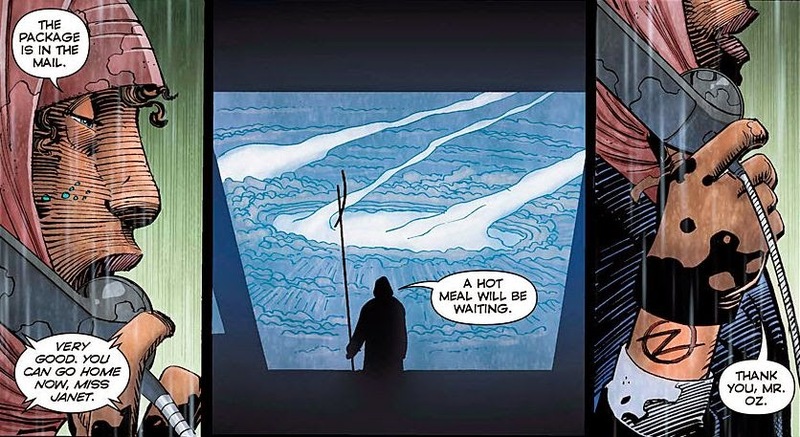 Remember that cloaked man who was observing Superman fight Ulysses and talkd about 'teaching' Superman? I thought it was going to be some version of the Eradicator. Or maybe a robot Pa Kent. Or something else. Well, at least we now have a name. Mr. Oz. And in what looks like mind control, he has someone mail a package to Clark at the Daily Planet. The person has a tattoo that could be a Z superimposed on an O. (At first I thought it was Adrian Veidt's Nostalgia Perfume bottle. I have a mega-theory about this guy ... but I'll save it for the end. 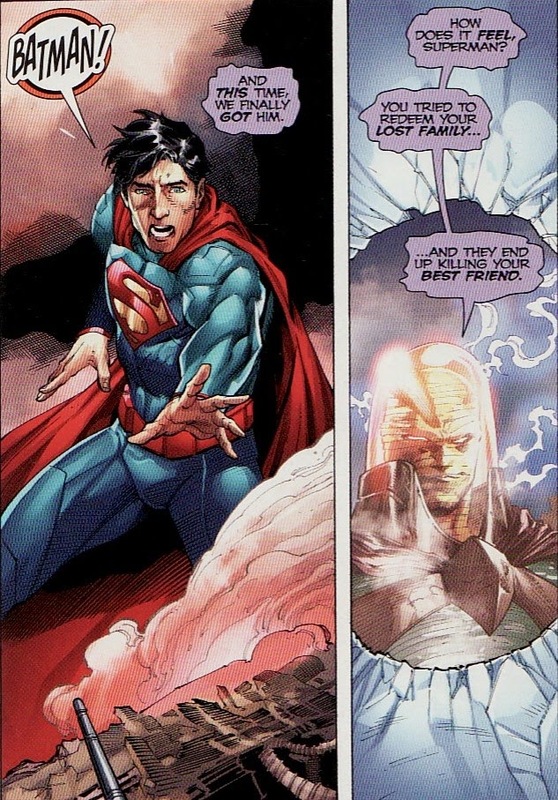 Last issue ended with Clark revealing he was Superman to Jimmy. Here we get to see Jimmy's response, from shock to wide-eyed to more shock to more wide-eyed. Even the progression from darker to lighter color in the background works nicely. This is a great moment for Jimmy and it is getting brighter the more he thinks about it. I thought it would be Perry that Clark would reveal this too. I would prefer it was Lois. But I don't mind Jimmy. There is some youthful energy here. And then Jimmy wonders why he didn't notice it before. Why didn't he see that Clark was Superman? I had to include this moment because it reminded me of one of the wildest books of my youth, Superman #330. 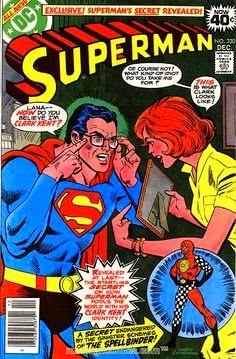 In that issue we learn that Superman is constantly using low-level super-hypnosis when he is wearing Clark's glasses, skewing their perception of Clark to something a little less Super. And so begins a day in the Private Life of Clark Kent. It is a day where he is vulnerable. He shares with Jimmy what it is like to have powers. He tastes differently. He hears differently. But even without his powers, Clark is willing to sacrifice himself, hurt himself if necessary, to help others. That includes diving to the ground to catch a kid falling out of a tree. Nice. At least in his time on the book, Johns puts Clark back at the Planet. I would love to see some sort of office fallout from this. Remember, Clark gave a 'holier than thou' speech in the Planet as he stormed off to ClarkCatropolis. Wouldn't there be some ill will? Or schadenfreude that he is back? I did like the return of some journalistic rivalry between Lois and Clark. This felt retro and classic and welcomed. We then get a great scene in which Superman, even without his powers, confronts a crook who is holding a gun to a hostage's head. A bullet could kill Clark at this moment. But he won't stand down. We have to help. Not only help the man being held. But help the crook, help him see how pulling the trigger would make things much much worse. Without blinking, without pausing, Superman makes his way through the police and asks the man to put down the gun. The man will pay for his crimes. But pulling the trigger would be crossing a horrible line. And that frank talk, that inspirational presence gets through to the man. 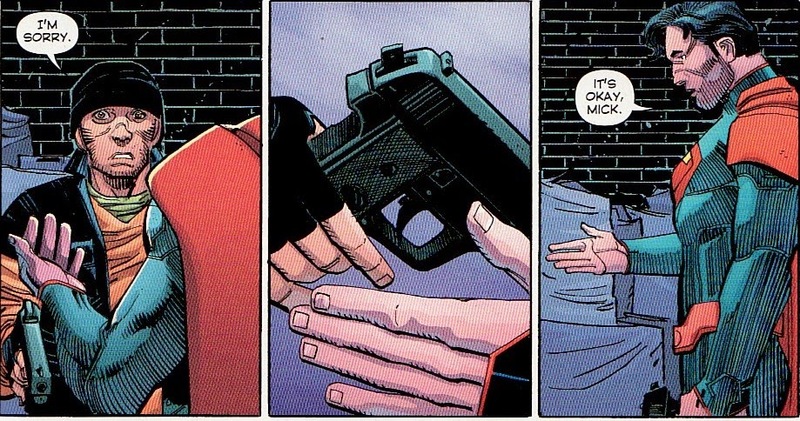 He hands the gun to Superman. The crisis is over. Without a punch. Without powers. Afterwards, Jimmy questions why Superman would risk his life there. 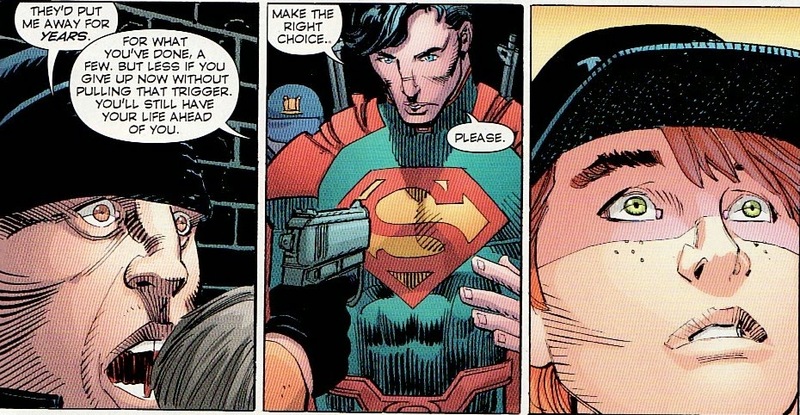 Superman says that he doesn't jump in front of guns because he has powers and won't get hurt. He does it because it is what is right. "What choice did I have?" Maybe Zach Snyder should read this. Having been exposed to the sun for the day, Superman's powers finally return. As I said before, Romita reins it in this issue with several 9 panel pages and standard page layouts. 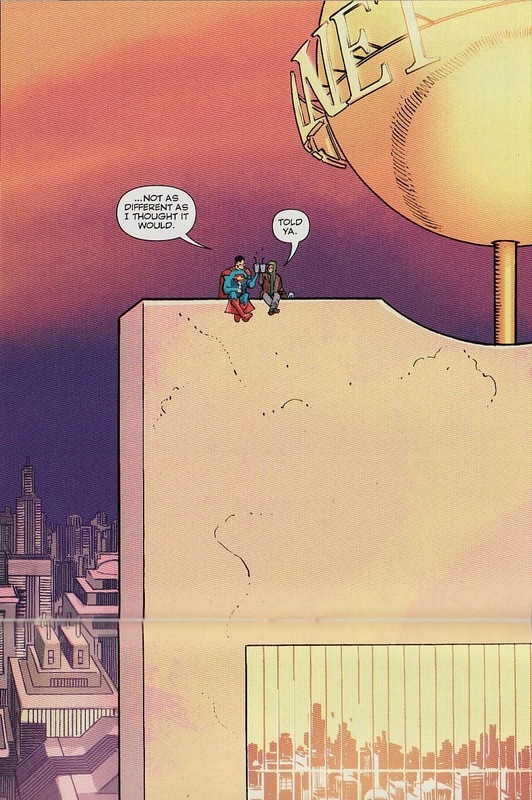 But the end has Superman and Jimmy sharing a snack on the Planet roof, a 2 panel, 2 page splash. While printed horizontally, they are oriented to be held vertically (see the fold in the scan). While the majority of these pages is a building, I thought this use of space worked well. This whole story is how Superman was human for a day. Here he says that he didn't feel that different. He was the same person with or without patient. It shows his humanity. 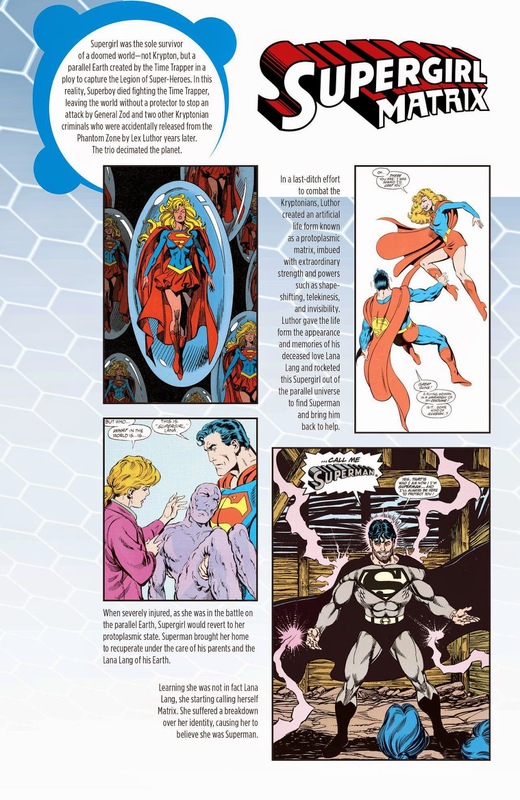 And here, we see Superman as a small element of the page. This isn't a huge heroic iconic pose, bigger than life. This helps bring across the point of his humanity. That in many ways Superman is a guy with big ideals and ethics, who has powers that help him. In the end, Mr. Oz package arrives, a blank notebook with an S-shield cover. The future is yet to be written. Okay, I think Mr. Oz is ....Geoff Johns. Oz is someone manipulating things behind the scenes, behind the curtains (like the Wizard of Oz). Here, Mr. Oz seems to be viewing Superman from somewhere else, like a movie. Oz claimed to teach Superman important lessons like not 'punching down'.And, of course, the blank notebook meaning Oz isn't writing anything moving forward. Johns, as a real person who wrote Superman, would be seeing things from a distance, pulling the strings by writing the stories. He did teach Superman lessons as his writer. As the writer, he has 'mind control' over characters like the person on the first page. And he is off the book. His pages are empty moving forward. 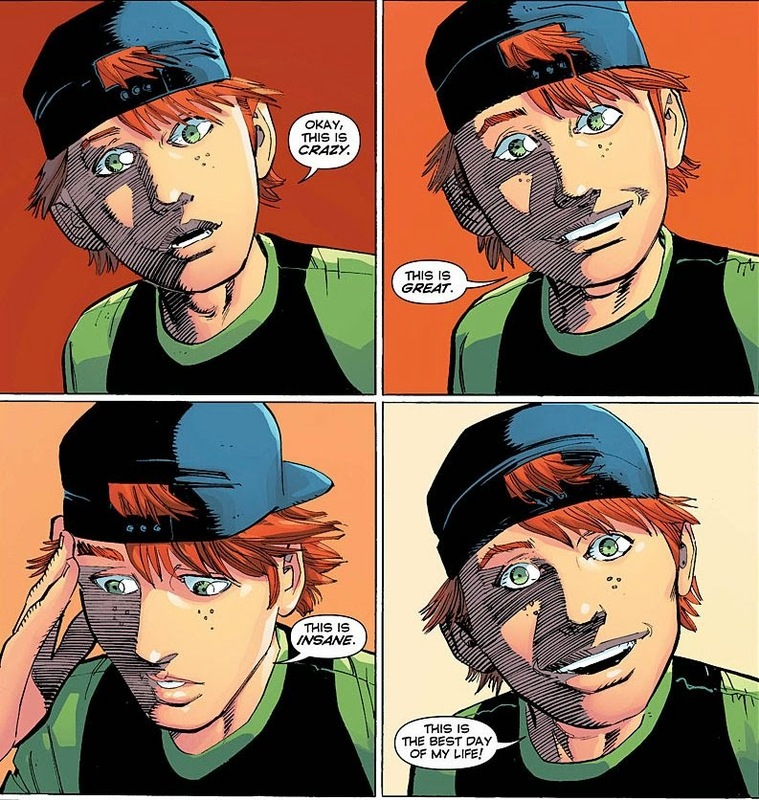 Maybe Oz is somehow Johns responding the Superman stories that came before him, trying to reteach him those lessons. Heck, the first thing I thought of when I saw the Oz tattoo was Veidt's Nostalgia. Maybe Johns is nostalgic for the sort of Superman he wrote. I'll say it again. Mr. Oz is Geoff Johns. Or is that more a Grant Morrison thing? Anyways, stories like this are few and far between these days, a rest issue showcasing the character of Superman. While old timers like me remember this selfless Superman who emphasized the Clark within him, we haven't seen this too much recently. Of course, I loved it. 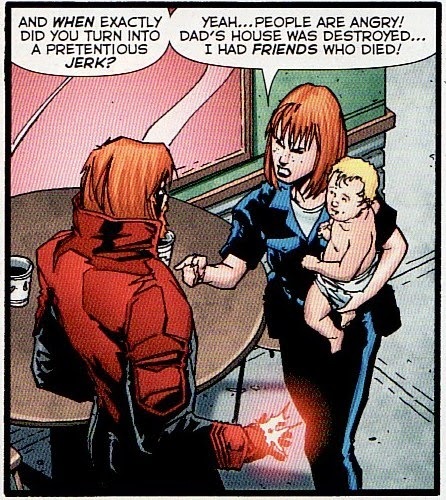 This issue was the highlight of Johns' brief run for me.